This house was built in 1906 in Seattle’s Capitol Hill neighborhood and looks like the Classic American Family Home to me — although the truth is, despite what we see in movies and TV shows, few of us actually live in houses like this, do we? (I wish!) It’s been restored and redecorated, so let’s take a look around. It sits a block away from Volunteer Park and Millionaire Row. The house has 5 bedrooms, 5 baths, and 5,100 square feet. How fabulous would it be to grow up in a bedroom like this with a sunroom off it? I found this old postcard of the Capitol Hill neighborhood in Seattle taken around the time this house was built in the early 1900s and thought it was so cool. Can’t you picture this house sitting alongside the others in the photo? Is it awful that I like the before photos more than the renovated photos? 🙂 The colors were just so warm and inviting! Although that bathroom (the one with the old tan/green tile) and kitchen are spectacular!!!! WOW! Beautiful! So much fabulousness under one roof! And the bedroom with the sunroom … LOVE! Thanks for sharing. Although I appreciate the warmth of the ‘before’ photos, I appreciate the lighter colours too. I have a small Arts & Crafts (1100 sq feet) and seriously debating about painting it white. It’s so clean and scultural looking – and lovely whatever colour the owners choose. I don’t think I have ever commented though I do love your blog. I had to comment today to say WOW. Not so much wow at the house, though it is beautiful, but wow at the picture of the neighborhood in the early 1900s. Seeing the picture really brings to mind how different times were and how grand houses were. I know there were also ghettos then or at least poorer areas with tiny houses, but seeing a picture of that grand neighborhood is pretty awesome. Thanks for digging it up! Isn’t that cool? I love old postcards and photos of houses! I too love the old pic, Julia. Thanks for including this. Beautiful home, but I agree with some others; I really liked the home before the renos. Oh, Julia… this one is perfect! I really love this one! So much charm and what to say about that kitchen??? i recognized this house right away! i used to live next door! if fact, i can see the house i lived in through the windows of these photos. 🙂 i LOVED living in this neighborhood…amazing houses everywhere you look! I agree! The houses are spectacular. I used to live in an apt. on Capitol Hill and loved to take walks through this neighborhood. One of the prettiest I’ve ever seen! Beautiful moldings and trim throughout. Love that kitchen! Thanks for sharing it with us. I’m in the camp that prefers the before pictures too. It just seemed more warm and inviting. I’ll always like oriental rugs better than the type they have now. Spectacular bathroom! What a gorgeous home! It reminded me of many that were in the Victorian neighborhoods of Ditmas Park and Park Slope in Brooklyn, NY. Wowsers!! Just gorgeous. I could move in right now! It is lovely – but I see a lot of woodwork painted white! boo-hoo! I am in love with that master bath and walk-in closet. I can haz? I’ll take one, please! Love everything about it. Isn’t it funny – I haven’t had any time to read blog posts in the past several months, and I stumbled on yours today… just as we are considering moving home to Seattle after spending the last 3.5 years in San Francisco. Such a difficult decision – beautiful homes (like this one – WOW!) in both cities. Sounds like a sign to me, Caron! 🙂 They really do have more than their fair share of beautiful houses in both cities. Good luck with your decision! LOVE! I also like some of the before rooms but would take either way! love the master bathroom and kitchen!!!!! Oh.My!! I love this!! I love everything about it!!! The gray color that seemed to follow was clean and classic looking. Fell in love with the bedrooms and baths shown! In fact, I hated knowing that there wouldn’t be enough photos of everything I wanted to see 🙂 Love this house. I think that a wood countertop on an island without a sink would be great. We have butcher block countertops in the kitchen in our new house. We love the look, but I think the maintenance around the sink is going to be fussy. Not to mention around the coffeemaker, crockpot, etc. We shall see. We moved into our new house two weeks ago and stuff is still everywhere. Thanks for providing an inspirational break from all the craziness. Another shout out. Just loved this home. Love this one. So elegant but not too over the top. Wow. I absolutely love the bones of it (the actual decor, not so much – not my style, esp the kitchen). But the potential is mouthwatering. My initial reaction to “How fabulous would it be to grow up in a bedroom like this with a sunroom off it?” was: I’d never leave. Ever. My parents would never be able to kick me out. Then I realised that actually I’m a grown adult who doesn’t live with her parents but owns her own house. And has done for *ahem* a while. I think perhaps it is just such a ‘grown up’ house I don’t see myself as ‘grown up’ enough to own it. Live in it and get yelled at for putting fingermarks on the woodwork yes, own it no. Alas there is also the money issue. Neither I nor my parents could pull that off. But ooooh it’s beautiful!! Capitol hill has so many beautiful old houses, and now…bigger trees!! What a lovely, lovely home. It is quite big! Five bathrooms! wow. Beautiful, big but very homey. Lots to love. I really love the wallpaper in the dining room and I am not typically a wallpaper person! Thanks once again for finding a treasure to share. Wow! What a beauty. That sun room is amazing. That and the kitchen were my fave–Really special, thanks! 5100 square feet! The exterior and (most) of the interior is spot-on. So pretty! Is this house single, cause I want to marry it. Awesome! It’s so beautiful. All rooms are nicely decorated. Kitchen is really good and kids room is eye catching. I really want to own it. Love this home. Thanks for share. You’re Welcome! I love that bedroom with the sunroom. It’s my favorite room in the whole house. I could see myself sitting in the sunroom all day and having the windows opened in the summer time. Hi Julia I’m sorry to say not all of us live in a place like this, but there is always the IDEA! I keep looking and looking can’t find anything that I don’t love about this home, I just don’t have $2mil US to spare our $ has dropped against the US$, we had it good for a while. This was lovely thank you for sharing. Regards Esther from Sydney. I would say this is a great home to live. I wish we have that kind of house in Aruba. Gorgeous home! Gorgeous! Very well done, and those professional photos make all the difference, don’t they? I LOVE the bedroom with the sun porch off of it and the window seat with book shelves either side. That would be a dream, but I’d want it looking out into treetops or a long view of mountains or sea, not a small city yard. If I’m going to dream, I might as well take it all the way :-). if you had to guess what would color are the folded bath towels in the white bathroom? Lovely home–quite tasteful and elegant. I like the old postcard too. I LOVE that kitchen! I was ooohing and aaaaahing over it when I noticed the long light fixture over the island is just like mine (except mine is antique brass.) Guess that was part of why I loved that kitchen! If only I had the $2.35M to spare, this could tempt me to return back to the old stomping grounds. I love how the palette and decor has been updated but any structural changes are invisible (or non-existent). Although some may not like the painted out trim, I like it and it seems to be pretty typical in the neighborhood. 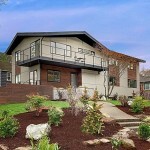 Besides the beautiful house and lovely residential neighborhood, the water and (huge) nearby parks, what you may not realize is that this home is a short distance away from skyscrapers, shops, restaurants, theaters and businesses of downtown Seattle. (To put in terms some may appreciate, just 2 miles away is Nordstrom’s big flagship store. Or for others with different interests, this is located in one of Seattle’s most artsiest and eclectic neighborhoods).